Leader of the Janatha Vimukthi Peramuna (JVP) and Chief opposition whip, Anura Kumara Dissanayake call upon Minster of Foreign Affairs and Lotteries, Ravi Karunanayake to resign from his post immediately. Speaking to Colombo Telegraph he said according to information unearthed by the Commission to inquire into the Bond Scandal, the minister had obtained a super luxury apartment at the Monarch Residencies leased by Arjun Aloysius while they, Ravi and Arjun, both were accused of robbing billions of public funds though two bond scams. “Most importantly Karunanayake was the Minister of Finance at that time. This is conflict of interest, he must resign,” Dissanayake said. The entire lease, amounting close to 9 million rupees, was paid for by a company named Walter and Rowe in which Arjun and his father Geoff are both Directors. It is a fully owned subsidiary of the holding company of Perpetual Treasuries. “This commission has no power to punish the culprits, it’s a long process. Ravi, being a minster, will certainly affect that process. 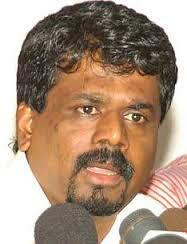 Since he can influence the justice process, he must resign,” the JVP leader further said. Meanwhile despite being summoned by the Presidential Commission of Inquiry into the Central Bank bond issue, Ex-Finance Minister Ravi Karunanayake was too busy to attend the commission today to give evidence. Karunanayake’s lawyer Sandun Gamage informed the Commission that his client will not be attending the Commission hearing due to ‘prior commitments’. The Commission has meanwhile re-issued the summons on Karunanayake, ordering him to attend the hearing tomorrow and give evidence in a case where one of the main suspects in the bond scam, Arjun Aloysius had allegedly paid the lease for the penthouse at the super luxurious Monarch Residences in Colombo 3 on behalf of Karunanayake and his family. The commission summoned the ex-Finance minister after a witness on Monday made this revelation during the hearing. Yesterday, the commission also ordered Aloysius to hand over all his electronic devices including mobile phone and laptop to the CID which he used during 2016/2016 to carry out further investigations against him.